"An unfiltered, unfettered, unprecedented brown ale aged in handmade wooden brewing vessels. The caramel and vanilla complexity unique to this beer comes from the exotic Paraguayan Palo Santo wood from which these tanks were crafted. Palo Santo means "holy tree" and it's wood has been used in South American wine-making communities. This beer is a 12% abv, highly roasty, and malty brown ale aged on the Palo Santo wood. It was a huge hit at our Rehoboth Beach brewpub when first released in November of 2006, Palo went into full production at the end of 2007. At 10,000 gallons, our Palo Tank is the largest wooden brewing vessel built in America since before Prohibition (and we have two same-sized Oak tanks right next to it)." 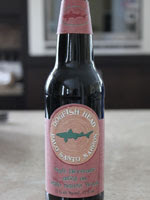 This treat from Dogfish Head, pours thick like a stout. Little to no head. Almost black with reddish burnt undertones like iced tea.Very fine bubble to the little head that did appear. Noteable alcohol legs. Breadiness, hint of a cedar like smell (from the Palo Santo wood). Vanilla, caramel and burnt sugar. Slight Floral and honey hints with an undertone of coffee. This beer smells fantastic! This is an incredibly complex brown ale. For 12% ABV, the alcohol is nicely masked. Coffee and vanilla are present, very imperial stout like. Plumb, raisin and dark fruits come forward with a slight syrupy mouth feel. Just an amazing brown ale. Very smooth and balanced from the front to the back of the mouth. This seems somewhere between an imperial stout and a Belgian quadruple. The woodiness is very interesting and adds to the depth of flavour. This is definitely an "off-centered ale" and challenges what a brown ale can be. I would give it an A for sure.